Patrickswell Brownes: Where are you Thomas Roche? Where are you Thomas Roche? married. Thomas, born about 1838 according to census records, was near 20. One daughter, Emma, was born while they lived in Wisconsin and was baptized December 20, 18591. 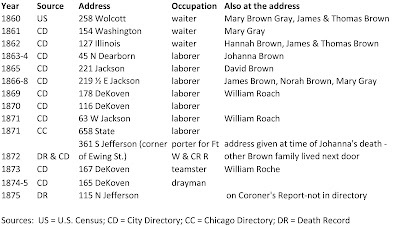 We also saw that they moved to Chicago by June 1860, when the U.S. Census2 was taken, and were living with a sister of Johanna, Mary Brown Gray and her family at 258 Wolcott in the north section of Chicago. 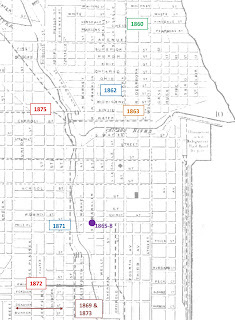 The 1870 U.S. Census3 shows Thomas, Johanna and two children, James and George (George David), living in the 9th Ward west of the Chicago River. (More information about James and George will be given in a future post.) William Roach was also living with Thomas and Johanna in the 1870 U.S. Census. William is identified elsewhere with Thomas and is believed to be a close relative. Very few records give Thomas’ occupation. Most sources show him as a laborer. The 1860 U.S. Census identifies him as a “waiter.” He was shown in the 1870s Chicago City Directories as either a teamster, or a porter for the Ft. Wayne & Cr Railroad. Whatever Thomas’s occupation, the Roach family moved very frequently – nearly every year. Whether they moved to be near work, or because of fluctuating family fortunes, they always lived near or at the same address as other family members; most often the Brown family; but, at times, with William Roche/Roach. See the list of addresses below and a map, right, identifying the location by year4. brain.” Today, we would associate that term with meningitis or encephalitis; however, in the 1870s, in a less sophisticated environment, it was used as a “catch-all” phrase when no other cause of death was apparent. Since his death was sudden, the more likely cause was a heart attack or stroke. Witnesses at the Coroner’s Inquest were Annie Roach of the same address, and William Roach of 592 South Morgan St., probably the same William who was living with Thomas and Johanna in 1870. Family history says that Thomas came from the same area as his wife, Johanna, in County Limerick. Because so many names, surnames as well as first names, are the same, it is difficult to uncover a baptismal record for an individual without the names of both parents and, at least, one sibling. Since William Roach was associated with Thomas at various times, speculation is that William10 is a brother, or at the very minimum, a close cousin. 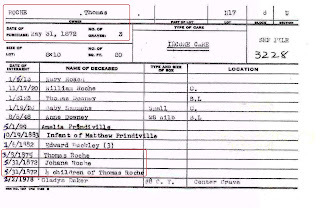 Because “Annie” was a witness on the coroner’s report, could she also be a sibling of Thomas? A search in County Limerick did indeed uncover a January 1838 baptism for Thomas Roche in Patrickswell and Ballybrown church records11, the same parish where Johanna and all of the Browne siblings were baptized, as well as a July 1850 baptism for Anna. The parents for both baptisms were David and Maria Roche. No record was found for William; but, as we recall from the Browne family, not all baptisms were recorded. (See previous post on Instant Gratification.) However, William’s death certificate gave his father’s name as “Patrick,” and no other baptism was found in Limerick with this criteria. 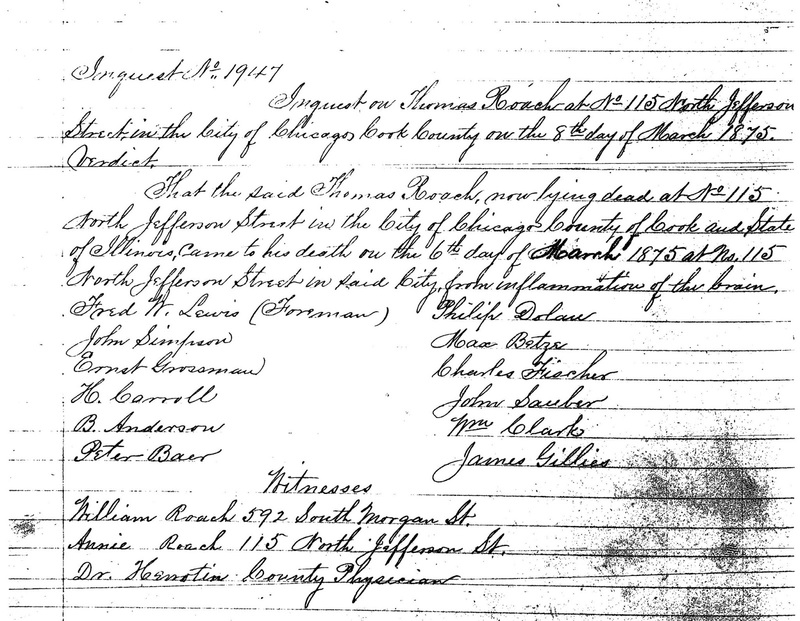 – not Patrick as indicated on William’s death record. Another family in Glanworth and Ballindangan also show baptisms for Thomas (December 1839) and Joanna (1841). The parents are listed as Patrick Roche and Ellen Keeffe. No record for William was found with this family. The parish of Castletownroche did have additional records for William where the father was listed as “Patrick.” One record was for William, son of Patrick and Bridget Roche, baptized in July 1847. Another record for William, baptized January 1847, gave the name of the parents as Patrick Roche and Elizabeth Connor. The baptismal sponsor for another child in this family was Ellen Hannigan. Recall from the last blog that a witness at the wedding of Johanna and Thomas in 1855 was Jacobus Hannigan. No records were located in Castletownroche for Thomas. 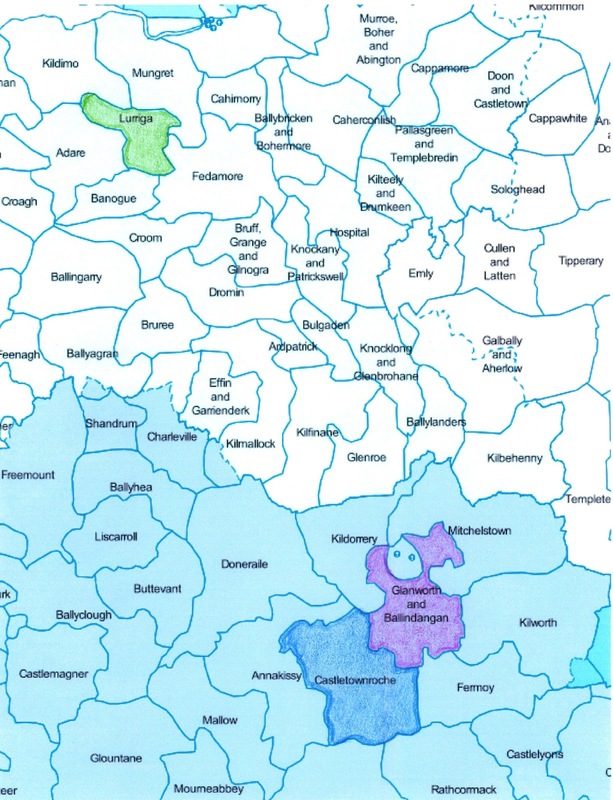 Could William in Castletownroche actually be a cousin of Thomas in Glanworth and Ballindangan? Or, although they are living in different townlands, could Patrick Roche have married a second time to Elizabeth Connor after the death of his first wife, Ellen Keefe14? One final thought about Annie Roach listed as a witness in the Coroner’s Report. We have learned in looking for a place of origin in Ireland for Thomas Roche/Roach that Annie is an alternative name for Hannah. Could “Annie” actually be Hannah Kelly Brown, the matriarch of our Brown family15? Another mystery to ponder! In the next blog, we will look at the children of Thomas and Johanna, James and George David. 1. Marriage and Baptism records from St. Patrick’s Catholic Church, Janesville, Rock County, Wisconsin. 4. 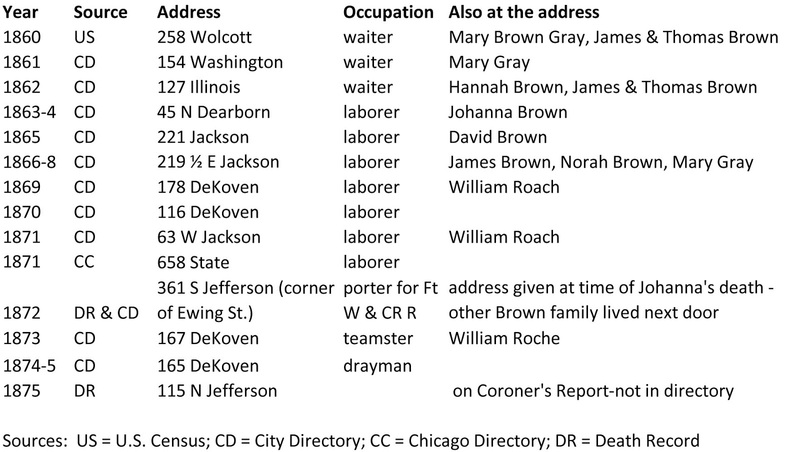 Addresses were obtained from the 1860 U.S. Census, 1860 to 1875 Chicago City Directories available on Ancestry.com, and death records for Johanna, (Indexes to deaths in the city of Chicago during the years 1871 to 1933, FHL film 1295973 [Burial Permits]), and Thomas Roach, (1875 Coroner’s Report). At times, more than one Thomas Roach is shown in the directories. 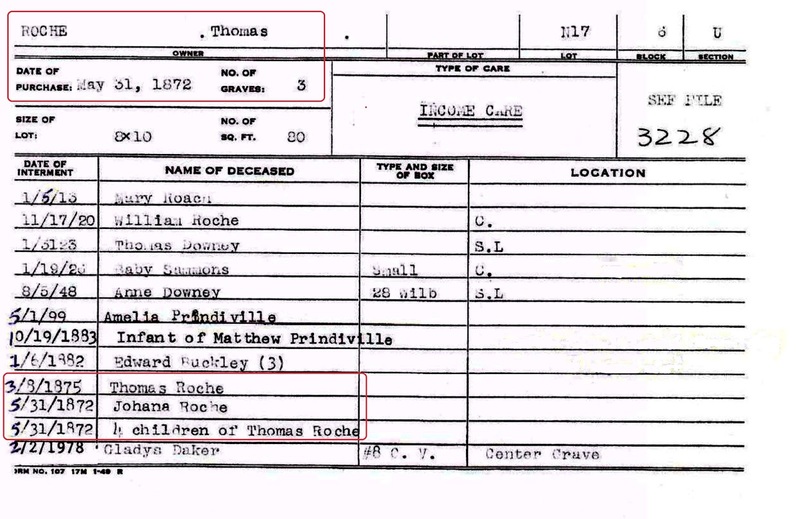 Entries for other family members, including William Roach, were used to determine the address for Thomas and his family. 6. Thomas and his family are buried in Calvary Cemetery in Lot N17, Block 6, Section U. The plot was purchased by Thomas May 31, 1872, the day Johanna was buried, and consists of three graves measuring eight foot by ten foot in total. At least fifteen burials are shown in the plot- eight adults and seven children. Until 1899, only Thomas, Johanna, and six children are shown in the three graves. Staff at the cemetery indicate that it was quite common for multiple individuals to be buried in the same grave. From cemetery records, death records and obituaries, we can identify the other individuals buried with Thomas and Johanna. Thomas’ close relative, William Roach, and William’s wife, Mary Ann, are buried in the plot. Mary Ann’s maiden name was Downey. The other individuals in the plot are relatives of Mary Ann Downey Roach. 7. Op. Cit. Indexes to deaths in the city of Chicago . . .
8. Chicago Tribune, The City, General News, March 9, 1875, p 8, column 1, paragraph 4. 9. 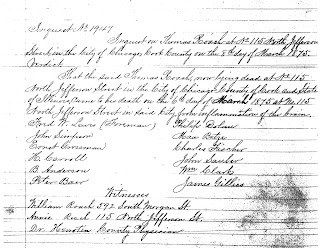 Illinois Regional Archives Depository System, Northeastern Illinois University, Coroner’s Inquest Record Index, 1872-1911, Thomas Roach, Volume 1, page 588, date filed 8 Mar 1875, date of death 6 Mar 1875. The final report did not indicate why there was a delay in contacting the Coroner’s office. The news article suggests the occupants of the house tried to suppress the incident and that Thomas was deceased for two days before a coroner’s report was made – a rather distressing thought. A conversation with Paul at the Northeastern IRAD office suggests that not too much trust should be placed in the news article. The purpose of any article in the newspaper was to sell newspapers and the circumstances could have been exaggerated. Perhaps a simpler explanation can be found. If Thomas was alone at the time of his death, whoever found Thomas may have thought he was sleeping. Not wanting to disturb him, the doctor was not summoned immediately. Once the doctor finally arrived, which could have taken some period of time, the doctor could not sign a death certificate since he had not attended Thomas before his death. There was probably a further delay for someone from the coroner’s office to arrive, especially since there was no sign of foul play. Two days may not have been unusual in these circumstances. 10. William’s year of birth is given on various records as anywhere between 1840 and 1850. His death certificate identifies his birth about 1849. The 1870 U.S. Census shows his birth year as 1845; 1880 shows 1840. The 1900 U.S. Census shows his birth as April 1850 and his immigration as 1860; 1910 shows his birth as 1850 and immigration as 1865. The 1920 U.S. Census show a birth year of 1845. 12. 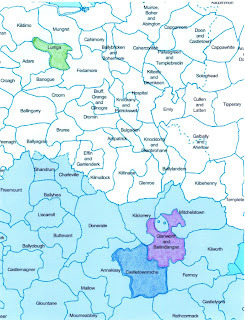 The parishes of Glanworth and Ballindangan and Castletownroche are located adjacent to each other in the north east corner of County Cork. 13. Wight, Judith Eccles, A Rose by any Other Name: a guide to Irish Christian names, available online at https://dcms.lds.org/delivery/DeliveryManagerServlet?from=fhd&dps_pid=IE105460. Ann, Anna, Annie are alternative names for Hannah/Honora, Johanna, and Nancy. Using a birth year of 1858, if this is the correct person, Annie would have been seventeen at the death of Thomas in 1875. 14. Dates of baptisms make it a possibility that Patrick did remarry. Ellen Keefe and Patrick Roche have baptisms recorded for four children: Timothy (September 1836), Margaret (May 1838), Thomas (December 1839), and Joanna (1841). Patrick Roche and Elizabeth Connor were married in October 1842 and had four children: Richard (May 1843), Ellen (April 1845), William (January 1847), and David (June 1849). 15. The news article about the death of Thomas states there was a “family” that occupied the house where Thomas was found. According to Judith Eccles Wight (see footnote #13 above) Annie can be an alternative name for Hannah. An Irish dialect often does not pronounce an “H” at the beginning of a word. We saw this in the 1850 U.S. Census when Hannah/Honora Brown was enumerated in Vermont with her children. The name in that record was written an “Annora.” Records for Honora Kelly Brown have been found using several variations of the name - Honora, Hannah, Johanna, Nora and Annora. Could the family living at the house have been our Hannah, the matriarch of our Brown family, along with James and George, the children of Thomas? Perhaps the coroner heard “Annie” when her name was given and just assumed her surname was “Roach” when the children called her Grandma? Thank you for your excellent research as usual and for the new information on Thomas. I was interested to read a few details about his death and I think you made good observations about the people and circumstances surrounding it. 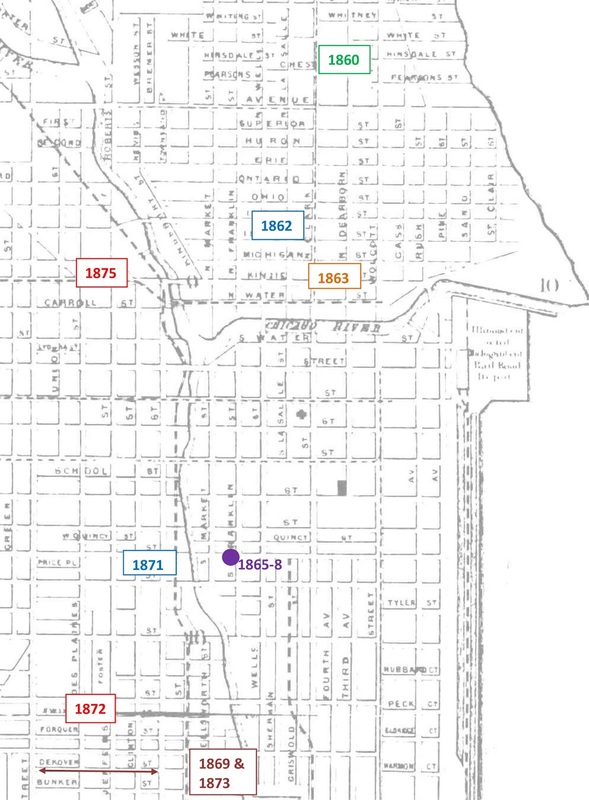 I am curious about the two different addresses in Chicago for Thomas in 1871, from two different sources. I do wish we could definitively identify Thomas in Ireland with his parents. You made a good effort in that direction and I'm sorry that has not yet been resolved. Yes, there were two different addresses given for the family in 1871 - one from the city directories and the other from a census for Chicago. I think this points out just how often the family moved. Depending on the exact day and month the information was gathered, the results could be (and were) very different. I also wish the mystery of Thomas's origin could be solved. One time I look at the records, and because of the sheer numbers of records in the Castletownroche/Glanworth and Ballindangen area, I think he had to have come from Cork. However, the next time I look at the information, I think it must have been Limerick. When I reviewed my notes, I found a "John Roach" living at the same address on Humphrey Place in Boston as the Brown family. I don't think that is a coincidence especially when both the Roach and Brown families ended up in Wisconsin and Illinois.